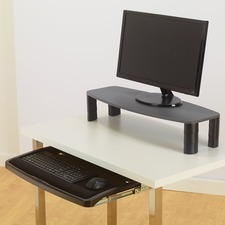 Keyboard drawer/monitor stand is designed for use with both standard and corner workstations. Adjusts both keyboard and monitor height to match your Kensington SmartFit personal comfort color. 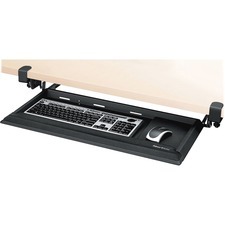 Universal design works over or under desk to fit any work space and individual body size. 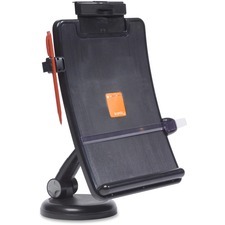 Stand keeps eyes in line with screen to reduce neck strain, and arms angled for optimal typing position. Monitor stand remains above desk when the drawer is mounted underneath. Extra-wide, easy-glide drawer hides keyboard and mouse when not in use. Patented keyboard platform blends functionality with contemporary, high-tech design. Combined with our adjustable Pinnacle 2 Arm and low-profile ball bearing track, for ultimate comfort and style. Height-adjustable copy holder features a curved tray that reduces overhead glare and improves your viewing angle. Extra-stable weighted base increases stability for reliable performance. Spring-loaded, reversible line guide adjusts for easy reference. 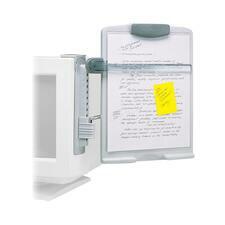 Side-mounted paper clip holds legal-size and letter-size stapled documents in place. Copy holder tilts and rotates to fit in front or on the sides of your monitor. Economy articulating keyboard and mouse platform adjusts up/down 5-3/4", offers an 18" track length, swivels 360-degree and tilts positive/negative 15 degrees. The platform is vinyl-coated with an enclosed palm rest. Mousing surface can be used to the left or right of the keyboard. 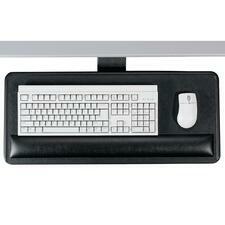 Keyboard tray with foam wrist rest will work in standard workstations. Keyboard platform is designed to fit the HON 10700, 10600, 11500, 10500 and 94000 Series deluxe modular desking. Surface can be positioned at 2", 2-1/2", 3" or 3-1/2" below bottom of worksurface. 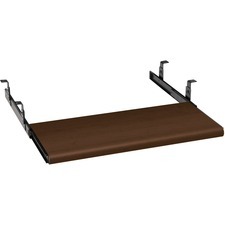 Minimum clearance for mounting is 22-7/8" wide x 17" deep. Design will not fit on a 37" x 24" corner worksurface. Keyboard platform features a laminate finish to blend with your decor. Fellowes Tilt 'n Slide™ Keyboard Manager - 3.4" Height x 11.5" Width x 29.3" Depth - Black The Fellowes® Tilt 'n Slide™ Keyboard Manager features strong brackets that easily attach to desktop edge up to 1-3/4" thick without tools, allowing platform to effortlessly tilt and slide. Extended knee clearance keeps you comfortable while typing and mousing. Single lever easily adjusts tilt (flat to 30°) and slide (4-5/8" travel distance). Unique textured surface keeps mouse from sliding off mousing platform. Ultra soft memory foam wrist support with Microban® antimicrobial product protection keeps product cleaner. 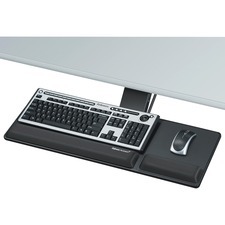 Fellowes Designer Suites™ DeskReady™ Keyboard Drawer - 3.1" Height x 28.6" Width x 14" Depth - Black - Steel Fellowes® Designer Suites™ DeskReady™ Keyboard Drawer easily attaches to most workstations without tools or complex instructions. Patented clamp attaches unit to desktop (5/8" - 1-1/2" thick) without surface damage (33-3/4" wide space required). Offers 3 height positions below desktop to ensure personal comfort: 2-3/16", 2-13/16", and 3-1/2". Soothing memory foam wrist supports with Microban® antimicrobial protection stay cleaner and place hands/wrists in neutral position. Separate keyboard and mouse platforms allow you to position mouse on right or left side of keyboard tray. Sturdy, impact-resistant tray fits standard keyboards. 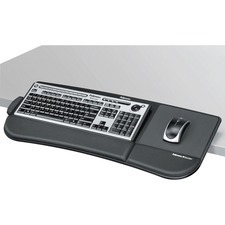 Fellowes Designer Suites™ Compact Keyboard Tray - 3" Height x 27.5" Width x 18" Depth - Black Fellowes® Designer Suites™ Compact Keyboard Tray enhances comfort in smaller workspaces. Loosen single knob to adjust tray height and tilt, then retighten knob to lock in position. Warning Trak™ helps prevent mouse from sliding off platform. Standard platform accommodates both right and left-handed mousing. Soothing memory foam wrist supports with Microban® antimicrobial protection stay cleaner and place hands/wrists in neutral position. 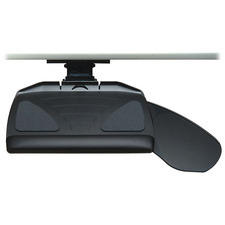 Features compact 17-5/16" glide track to fit restricted workspaces. Non-skid pads prevent undesired keyboard movement. Monitor View Clip holds copy at eye level and swings out of the way when not in use. Height-adjustable bracket mounts to either side of the monitor. Adjust viewing angle for customized comfort. See-through line guide helps keep your place. Extending copy clip will adjust for letter-size, legal-size and international-size paper.